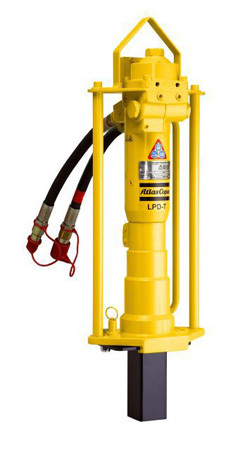 The Atlas Copco LPD-RV post driver is available in Ithaca NY, Rochester NY, and Upstate NY from the Duke Company. The LPD-RV is the perfect all-round driver. It has an built-in anvil and a front end that allows for a quick mount of adaptors and bushings for small diameter rods. Special composite guiding bushings called PTFE protects the zinc or copper surface from the driving rod. The sliding surface of the composite material permits smooth, low-friction operation. The push-down trigger system is perfect for driving light fences, tent stakes and ground rods. A remote valve gives you extra reach. The LPD-RV comes with a two foot long tail hose. It has a remote on/off valve, which allows you to activate the driver when it is placed on top of tall posts. The post drivers accept a high back pressure in the return line, which allow you to operate from almost any hydraulic outlet – even on skid steers with high return pressure systems – or when extremely long hoses are needed. The remote-controlled valve lets you run the driver with both open- or closed-centre systems.